Marte went 3-for-4 with a solo home run and scored twice Sunday in the Diamondbacks' 4-3 loss to the Padres in 10 innings. While Marte's efforts weren't enough for the Diamondbacks to end their season with a win, his performance down the stretch at least offers optimism about his prospects heading into 2019. Over Arizona's final six games, Marte turned in four multi-hit performances and posted a 4:4 BB:K. Though speed was his primary calling card in the minors, Marte has only totaled nine steals during his two seasons in Arizona, but he's made up for his lack of activity on the basepaths with his improved power and plate discipline. 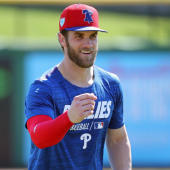 He walked in 9.4 percent of his plate appearances in 2018 and notched 52 extra-base hits, the latter of which ranked him in the top 20 among all qualifying middle infielders in baseball.